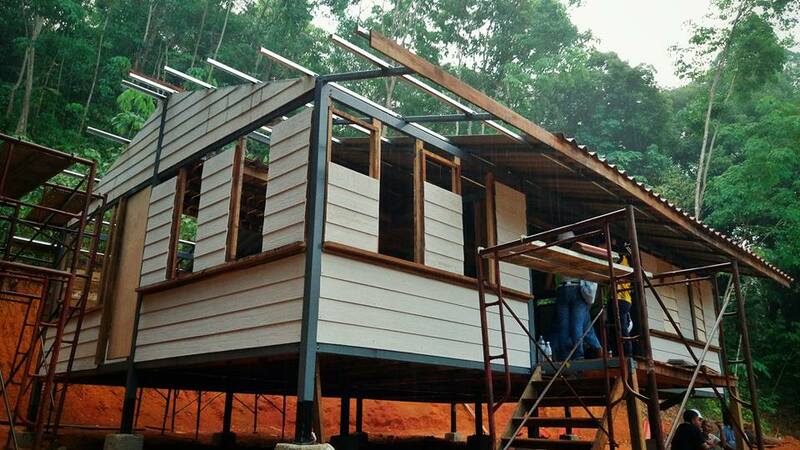 If you want to build a simple four-walled cabin out in the jungle somewhere, then you should take a look at the concept cabin that EPIC Homes builds for the indigenous peoples of Malaysia. 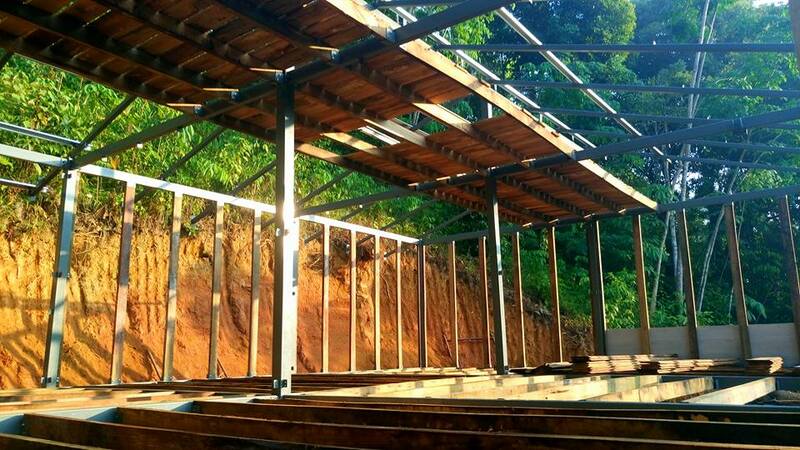 The steel structure is pre-fabricated with all of the wall and window brackets welded into the steel beams. 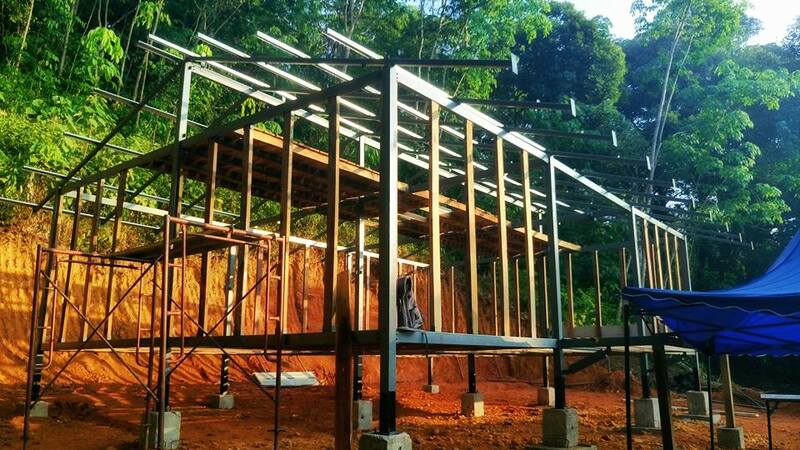 The entire structure can be bolted into place with eight people in about three hours. 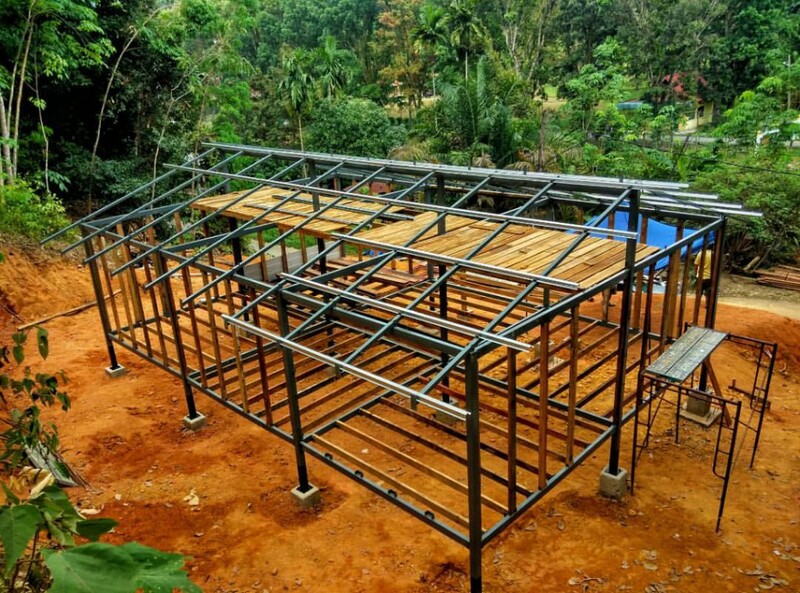 Once the steel structure is secured and aligned, the wooden 2×2 and 2×4 timber studs can be drilled into the pre-set brackets ready for the walls to be drilled into place. The joists are also drilled into the C-brackets in the ground floor, and across the attic storage area for the upper floor. Off-site, the roof tiles, walls, floorboards and window frames are being cut to size. Once the floor joists are in the Floor Team can begin knocking the floorboards in. 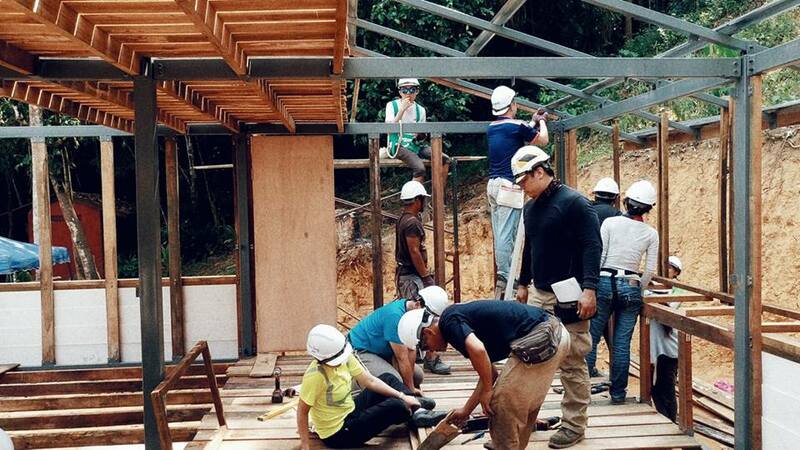 At this point the Roof Team is normally ready to start drilling their steel purlins across the steel rafters. The tiles, made of a cement composite, will be laid on top of one another and drilled at the top and bottom into the purlins. The Floor Team will take about two days to finish up the floor. The Roof team will also take two days to cover the roof. The Wall Team will begin applying the long, white Shera boards, another concrete composite fabric, to the wall studs. Timber frames for windows and doors are built and drilled into place. 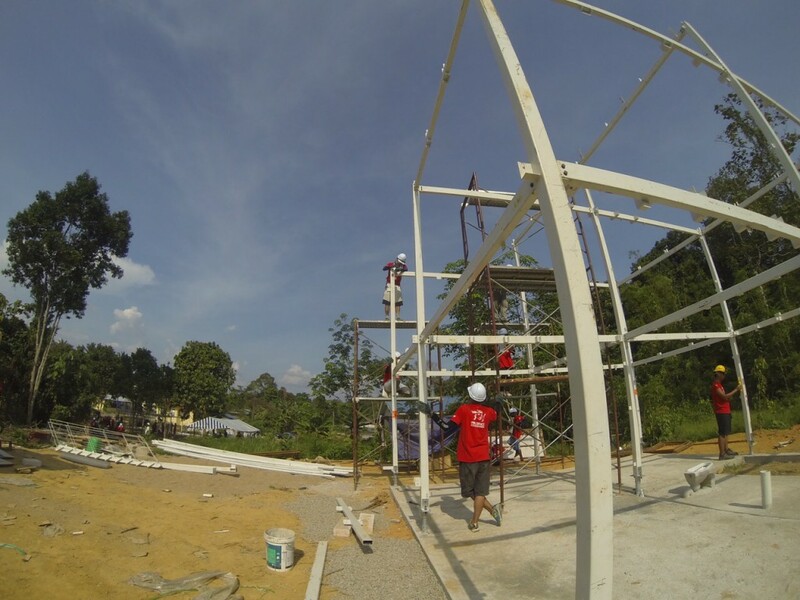 The front porch is bolted to the main frame and supported with 4×4 timber posts. The stairs are built from 2×6 pieces of timber and the two bottom pieces are sunk into the iron-rich red earth and coated in waterproof bitumen. Once the walls have been drilled in, the window frames and then the windows themselves are fitted. Front and back doors can also go in at this point. The internal walls are fixed to brackets in the steel structure and the interior is normally divided into two bedrooms, a kitchen and a large living area. At the back of the house the wall is slightly built out, which creates a kind of shelf for either draining washed pots and pans, extra seating or more storage space. 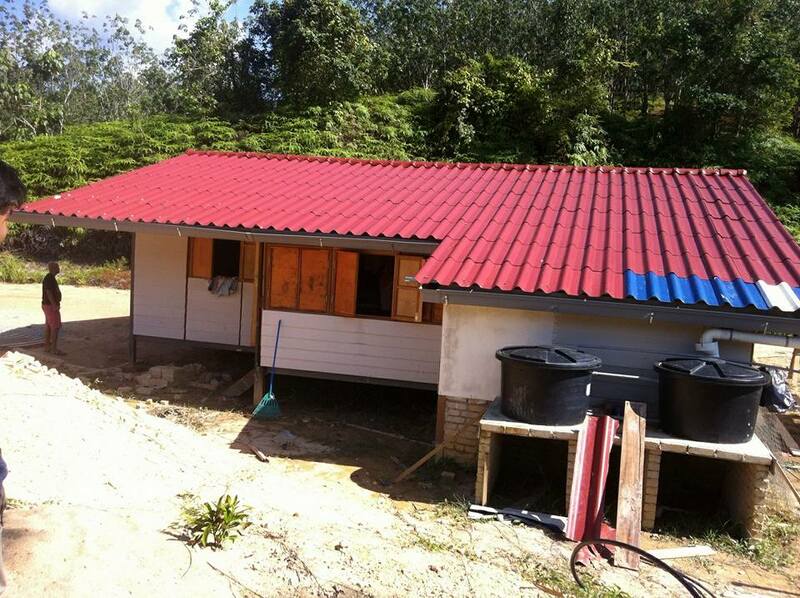 Many of the houses have rainwater catchment systems and septic tanks, so that grey water can be used for cleaning and flushing toilets, and waste water can be treated and flow back into the ground where it is purified and fertilises the ground. 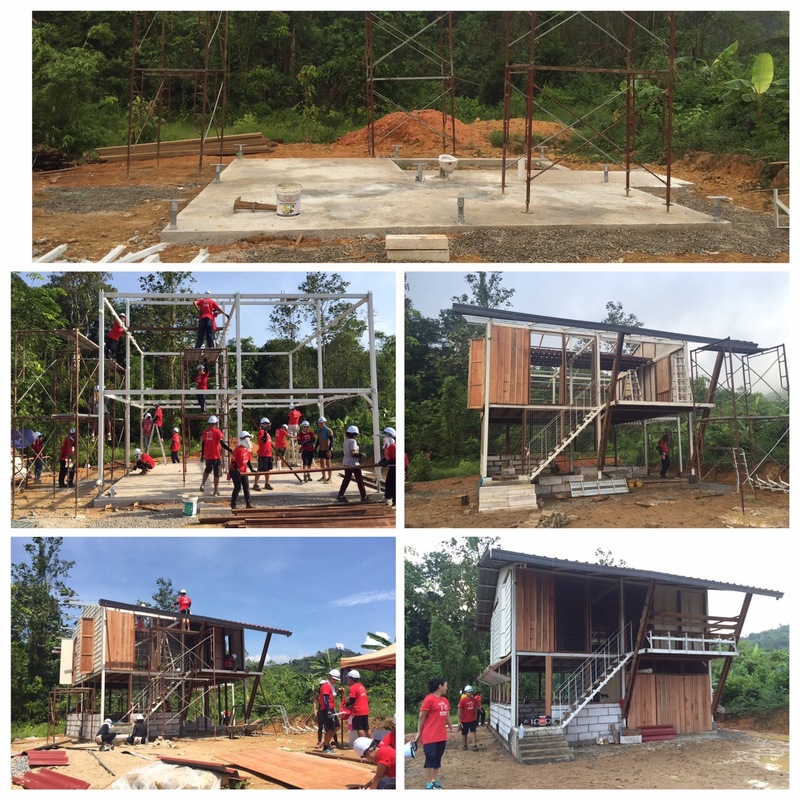 There are many variations to the cabin, including two-storey versions for flood-prone areas of Malaysia. The steel frame of a two-storey jungle cabin being bolted into position. 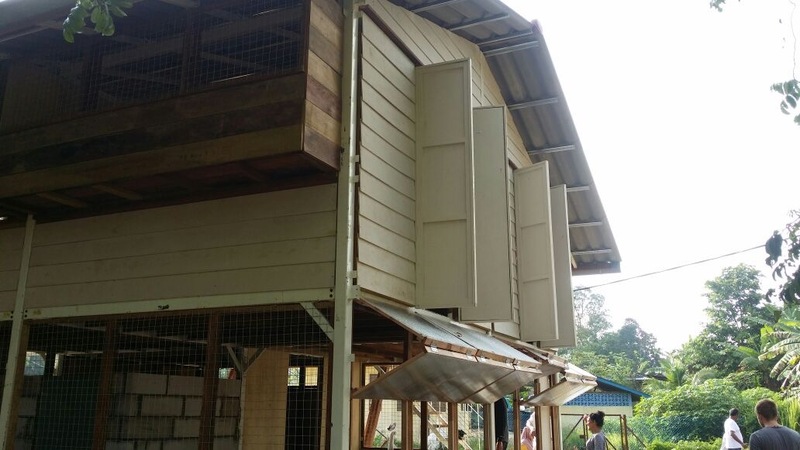 14 of these two-storey steel cabins were build in a flood-struck village that was washed away almost entirely in December 2014.